On Tuesday night, two of the best players in the NHL squared off for the final team during the regular season as Nathan MacKinnon and the Avalanche faced Sidney Crosby and the Penguins. 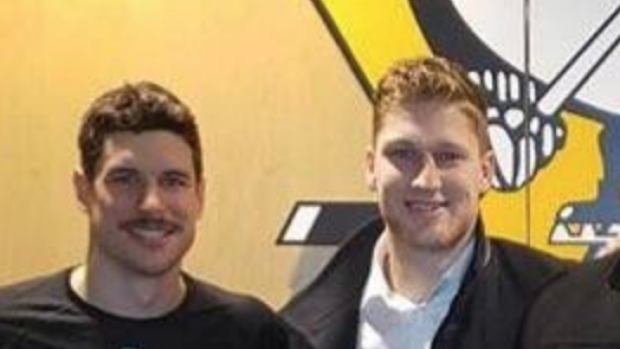 This time around, Crosby and the Pens got the win and held MacKinnon off the scoresheet, and after the game Crosby took an epic picture with some other famous people from Nova Scotia. It turns out Crosby wasn't the only player that got a picture with the boys. MacKinnon also had the chance to take a picture with them and Crosby following the game. MacKinnon has known the stars of the show for a long time and he even starred in Season 11. We've come to the conclusion that we need more of Crosby, MacKinnon and the Trailer Park Boys together because the pictures alone get us excited.